In my job, I see a lot of pit bulls, whether at an Austin shelter, a rescue in Los Angeles, or here in our New York City offices, where we occasionally foster dogs from the ASPCA Adoption Center. I look forward to each visit, not just because I'm typically greeted with a clownish grin, big open paws, and a wildly flapping tail, but because each pit bull I meet is also an individual, distinct character. This is why prejudice against the pit bull breed -- which is really a combination of many breeds -- makes no practical sense. This isn't just a rhetorical debate -- the lives of millions of animals are at stake. So it's important to identify what we actually know about this maligned and often misidentified breed, as well as what we don't know. We know, for example, that every dog -- even dogs within the same breed -- is different. That's what makes each unique, special and beloved by its human family. We also know that dogs' personalities aren't based on just a single influence any more than our own personalities are. A dog's behavior is a function of breeding, yes, but also just as strongly affected by socialization, training, environment, and how it's treated by its owners. Historically, some pit bulls were bred to fight other dogs. Early bulldogs -- forbearers of the modern pit bull -- were pitted against bulls, bears and other large animals. When these fights were banned in the 1800s, people turned instead to fighting their dogs against each other. But even these dogs, bred to be aggressive to other dogs, were not bred to be aggressive toward people, since fighting dogs must tolerate frequent handling by the humans who train and fight them. Meanwhile, other pit bulls were bred expressly for work and companionship. Pit bulls have long been popular family pets, noted for their affection and loyalty, but you don't hear much about gentle, loving pit bulls in the media because a well-behaved dog doesn't make headlines. In American shelters, you'll find lots of pit bulls -- with lots of different personalities. What they share in common is a sad fate. 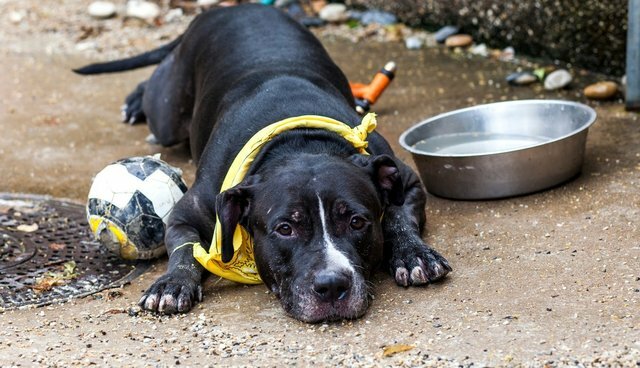 Because shelters and animal control facilities take in more pit bulls than any other breed, innocent pit bulls are euthanized more often than any other kind of dog. At the ASPCA, we've seen and we study many factors that contribute to behavior development in dogs, resulting in sharp behavioral variations -- even between dogs of the same breed. A pit bull bred for generations to fight may not fight, just as a golden retriever bred for generations as a service dog may bite. But there are consistent measures owners can take to prevent or curb aggressive dog behavior. For example, if you chain or tether your dog outside, and isolate it from humans, you increase the risk that it will develop aggressive behavior. We also know that early, positive behavioral conditioning, including socialization, is probably the best way to reduce the likelihood of aggressive tendencies in dogs. Puppies that learn to interact and play with people and other dogs are less likely to show aggression as adult animals. Finally, we know that no matter its breed or background, every dog needs to be raised responsibly, including early socialization, proper training and supervision. States across the country largely agree that targeting breeds serves no useful purpose. Currently, no statewide policies discriminate against certain dog breeds, and 18 states have taken the extra step to ban breed-specific legislation, or BSL, most recently South Dakota and Utah. Even the White House has weighed in against laws that target specific breeds. Last year, the Obama Administration put out a clear statement saying, "We don't support breed-specific legislation -- research shows that bans on certain types of dogs are largely ineffective and often a waste of public resources... the simple fact is that dogs of any breed can become dangerous when they're intentionally or unintentionally raised to be aggressive." The statement also noted that the Centers for Disease Control concluded "the types of people who look to exploit dogs aren't deterred by breed regulations" and "it's virtually impossible to calculate bite rates for specific breeds." The ASPCA supports breed-neutral dangerous dog laws that focus not on breed but on individual dog behavior, as well as laws that prohibit prolonged chaining and tethering, and legislation that holds dog owners accountable for the behavior of their pets. Ask pit bull owners about their pets, and you'll hear the same things you'd expect from proud owners of beagles, retrievers, pugs, Labradors, or any blend among them. I encourage you to read about Domingo, Blue, and Spike through the words of loving owners who recently adopted those pit bulls from the ASPCA. I've fostered a number of pit bulls over the years, many of whom were rescued from horrific cruelty. I'm reminded of Dawson, the white pit who was kept in a closet and beaten with weights; Taz, a brindle pit who was found in a dumpster in 2003; and Champ, a caramel-and-white pit who was being trained to fight. Each of them was loving, playful, loyal, and affectionate. And each was, at one time, on a short and certain path to sadistic abuse or euthanasia, but is now in a loving home. Not every dog is a good match for every prospective owner, so educate yourself before adopting. Compare a dog's need for exercise with your availability to take it on frequent walks and runs. Compare its medical requirements to your ability to provide that care. And compare its behavior -- as documented and explained by shelter staff -- with your family's ability to maintain and manage that behavior. When taking in a new pet, ask questions, consider potential challenges, and remember that small children should never be left unsupervised around animals. Understanding dog behavior, providing dogs with the care they need and the supervision expected by family and neighbors -- these are the best ways to keep pets and people safe, to celebrate the joy pets bring to our lives, and to end the myths that unfairly and tragically cost so many their lives. Not all families will open their homes to a pit bull, but I hope many will open their minds.